The study, published today in the Royal Society Open Science journal, is the first to show evidence of squirrels arranging their bounty using "chunking," a cognitive strategy in which humans and other animals organize spatial, linguistic, numeric or other information into smaller more manageable collections, such as subfolders on a computer. Fox squirrels stockpile at least 3,000 to 10,000 nuts a year and, under certain conditions, separate each cache into quasi "subfolders," one for each type of nut, researchers said. "This is the first demonstration of chunking in a scatter-hoarding animal, and also suggests that squirrels use flexible strategies to store food depending on how they acquire food," said study lead author Mikel Delgado, a post-doctoral researcher who conducted the study along with UC Berkeley psychology professor Lucia Jacobs. Presumably, sophisticated caching techniques maximize the squirrels' ability to remember where they've stored their most prized treats while at the same time hiding them from potential pilferers, the researchers said. 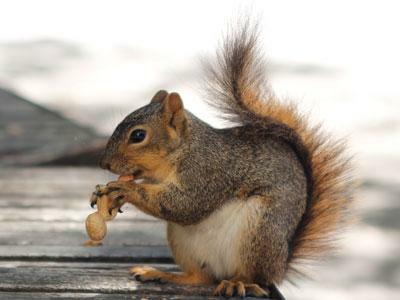 "Squirrels may use chunking the same way you put away your groceries. You might put fruit on one shelf and vegetables on another. Then, when you're looking for an onion, you only have to look in one place, not every shelf in the kitchen," said study senior author Jacobs.